This post on A Greener, Cleaner Home with Marley’s Monsters is sponsored. I received products in exchange for my review. With the holidays quickly approaching, I’m searching for unique gifts to give my friends and family. I love supporting small or local businesses and I happened to stumble upon one this summer on Instagram called Marley’s Monsters. Marley’s Monsters has friendly living essentials for the crunchy family, and boy, does that check off a lot of people on my Christmas list! 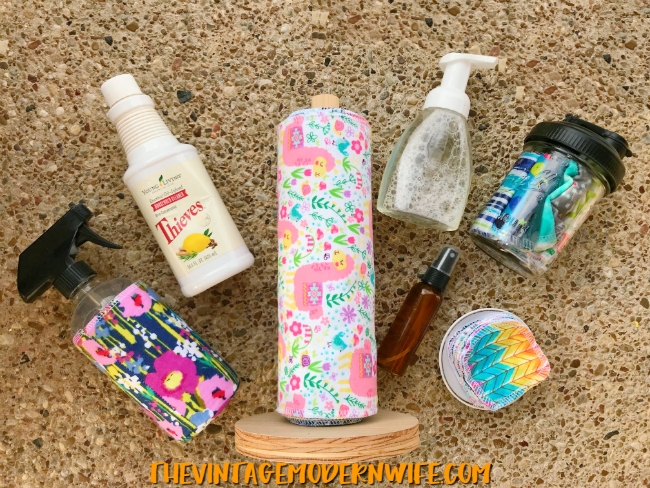 I immediately was drawn to their Unpaper Towels, their Cloth Wipes with the ReCap lid, the most adorable Glass Spray Bottle and Cover, and the prettiest facial rounds I’ve ever seen. 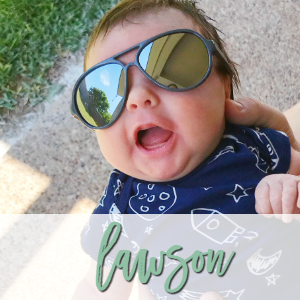 We use so many paper products in our home and we spend so much money constantly buying them all! I am all about saving money and not only are these great for our family, but all my Young Living friends who are trying to make the switch to a greener, cleaner home. 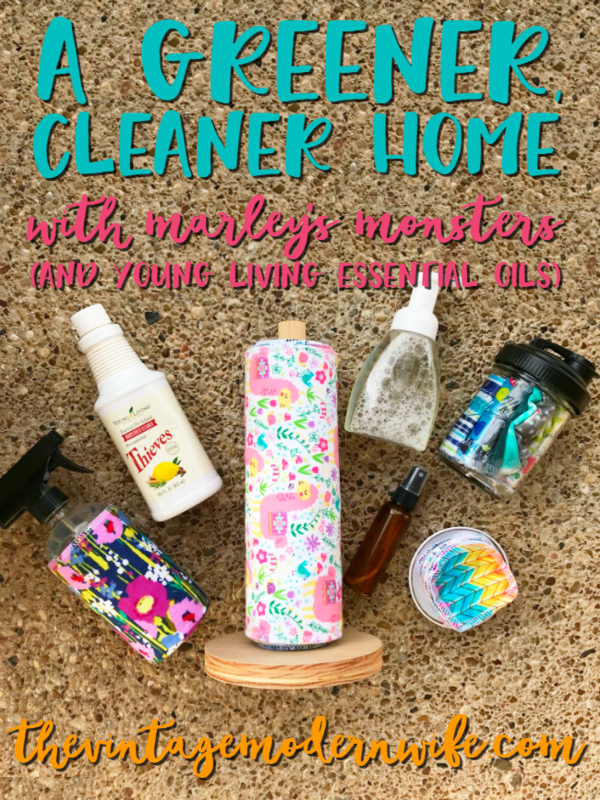 Once I got my hands on these products from Marley’s Monsters, I couldn’t help but make some easy essential oil DIYs for our house! This glass spray bottle from Marley’s Monsters is so cute and I love that it has a cover so it doesn’t slip out of my clumsy hands. 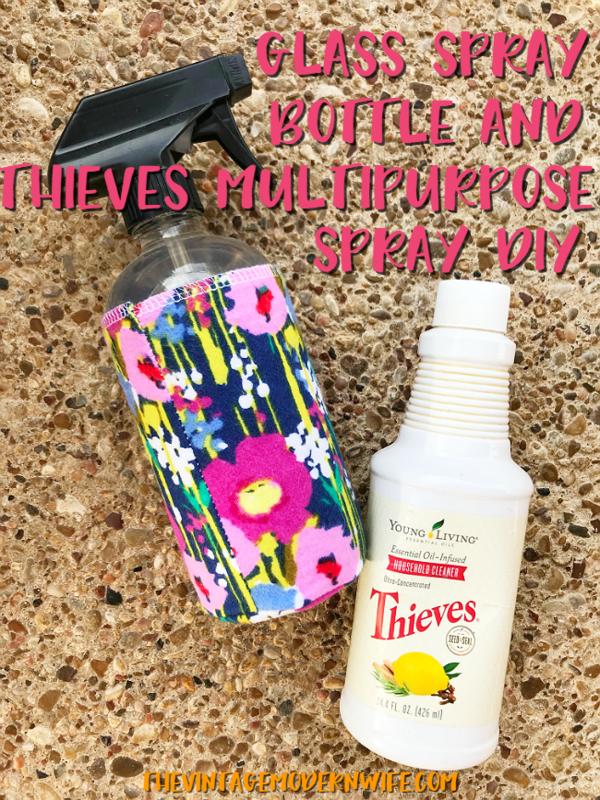 I use my Thieves Household Cleaner and pour 1/2 a cap full into my spray bottle and then fill it to the top with distilled water. I also added an additional 3 drops of Lemon essential oil for getting out tough messes easily. Because Thieves Household Cleaner uses Lemon essential oil, it’s necessary to use glass to store it in. Citrus essential oils are known to eat petrochemicals (the chemicals made to use plastics) so having a glass spray bottle is essential. I use this multipurpose spray EVERYWHERE in my entire home. Literally. If you look under my kitchen cabinet it’s the only spray bottle of cleaner I have. Thieves Household Cleaner has replaced our glass spray, furniture spray, tub and tile cleaner, sink scrub, floor cleaner, carpet cleaner, stain remover for clothes, ring cleaner, and so so much more. If it needs to be cleaned, we grab our Thieves Household Cleaner and that’s it! 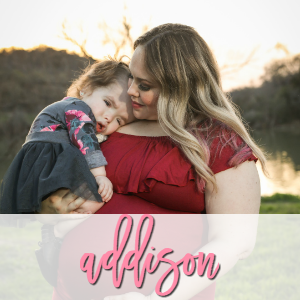 One bottle lasts me an entire year (and I use it constantly!) so I saved a ton of money when I grabbed the Thieves Premium Starter Kit because it has TWO bottles! Can I just tell you how much these Marley’s Monsters Unpaper Towels are saving us?! In our home, we’ve been using paper towels for everyone to dry their hands since Addie came home- because germs. Many people don’t wash their hands as long as they should to get the germs off their hands and when you use a hand towel, it’s likely filling with germs each time someone uses it. Yuck! In order to keep Addie healthy we made the switch to paper towels when she came home. We have spent SO much money on paper towels that it’s ridiculous. When I saw these insanely cute Unpaper Towels from Marley’s Monsters I knew I needed to get my hands on them. Not only would the Unpaper Towels save us money, but they would still help us keep germs at bay because guests would use them one time and toss them in a little laundry basket! Then, all we have to do is wash them (I put them in a little lingerie bag so they all stay together) and put them back on the roll! Super easy! 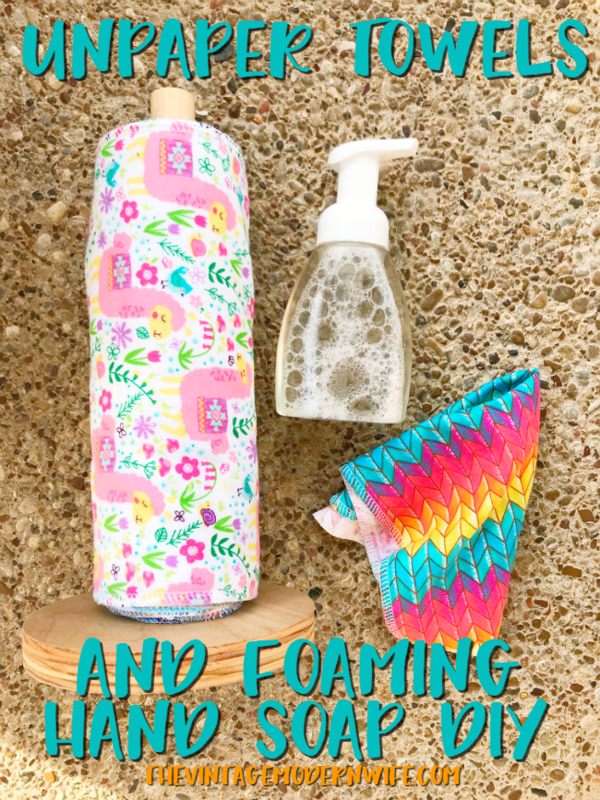 I always keep homemade foaming hand soap in all of our bathrooms, but especially in Addie’s bathroom. It’s easy to make, costs me pennies, and I don’t have to run to the store every time I need some. In a foaming soap bottle, add 2 tbsp baby castile soap, 1 tsp vegetable glycerin, and 8 drops of Thieves essential oil and 2 drops of Lemon essential oil (both found in the Premium Starter Kit!) You’ll find that when you make this soap, it’ll take you a minute or less and you can really use 10 drops of any Young Living essential oil to scent your soap! If you watch my Instagram stories, I make a lot of Thieves wipes. I usually buy Water Wipes and make my Thieves cleaner that way, but the wipes themselves can get costly month after month. I absolutely adore the Marley’s Monsters Cloth Wipes with the ReCap lid and decided to try making Thieves wipes with them. I wasn’t sure what it’d be like since they were fabric, but I love them so much! Not only are the cloth wipes adorable but they are sturdy enough for tough messes (my stove looks awful after I cook). In a measuring cup I poured 1 cap full of Thieves Household Cleaner and then poured enough distilled water to total 1 cup. Then I just poured the mixture into my recap lid container with the cloth wipes and BOOM- I was done! 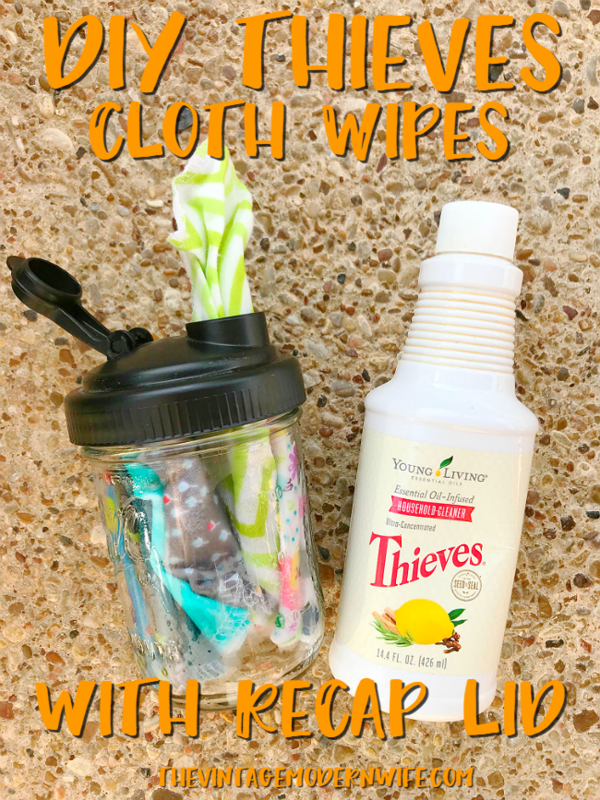 I love using the cloth Thieves wipes on my tables, counters, stove, and yes- even to clean up dog accidents. The recap lid on this is AWESOME and makes it easy to pull out one wipe at a time. If you want to gift this for Christmas like I will be, make sure to tell your recipient that Thieves is non-toxic. The combo of the Marley’s Monsters Cloth Wipes with the ReCap lid and the Thieves cleaner are perfect for little ones to help around the house safely and easily! Although this isn’t cleaning related, I couldn’t help but try these facial rounds from Marley’s Monsters. I go through lots of facial rounds as part of my skincare routine and these were so cute that I couldn’t help myself! These rounds are made of 2 layers 100% cotton flannel in mixed prints and the flannel becomes more absorbent after the first few washes. I like to keep them on a cute little mini plate in my bathroom so I can just grab as I need. If you have a friend that enjoys pampering herself at the end of a long day, definitely grab these facial rounds! I have a whole Young Living beauty routine- wash my face with Orange Blossom Face Wash, scrub my face with the Satin Mint Facial Scrub, tone with my homemade toner, add my favorite essential oil beauty serum, and then top off with some Sheerlume moisturizer. 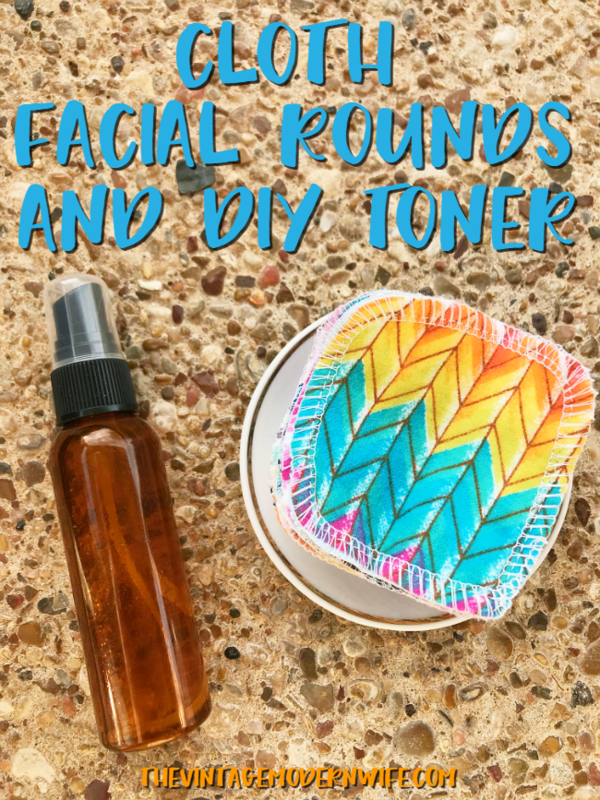 These facial rounds work perfectly with my homemade toner and feel so soft against the face. They’re easy to wash too. I just throw them in a lingerie bag, wash and dry, and put back onto my little mini plate in my bathroom! To make the toner you’ll need a 2 oz plastic spray bottle, unscented witch hazel, Lavender essential oil, Frankincense essential oil, and Copaiba essential oil (all found in the Young Living Premium Starter Kit!) With the plastic spray bottle I add 10 drops of Young Living Lavender, 5 drops of Frankincense, and 5 drops of Copaiba. Then, I pour to the top with witch hazel. Lightly shake and then spray onto your face. Wipe your face with the Marley’s Monsters facial rounds and you’re on your way to glowing skin! If you’re looking to find a unique and sustainable gift for yourself or a friend or family member this holiday season, grab these goodies from Marley’s Monsters and a Young Living Premium Starter Kit. You absolutely won’t regret saving so much money and having less trash. Which DIY with Marley’s Monsters and Young Living are you going to try? Which Marley’s Monsters product is your favorite? 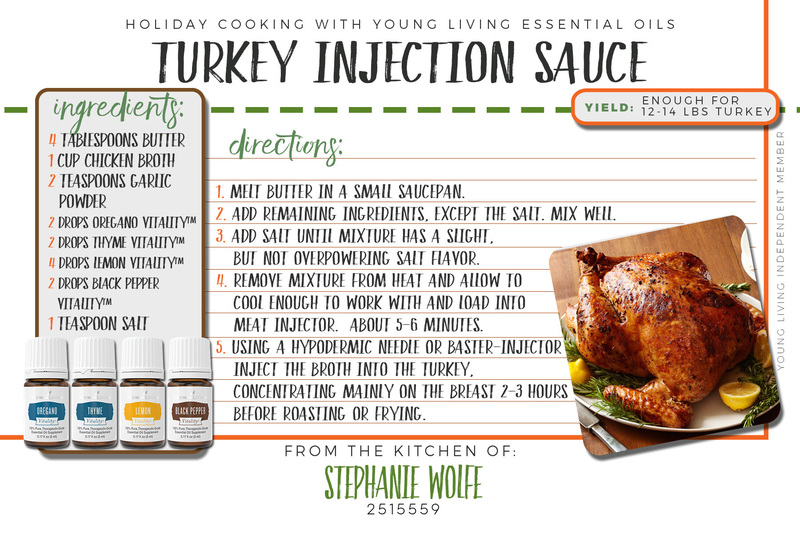 As many of you know, I LOVE cooking and baking with my Young Living Essential Oils. There’s something so fun about being able to use my oils in such a variety of ways! 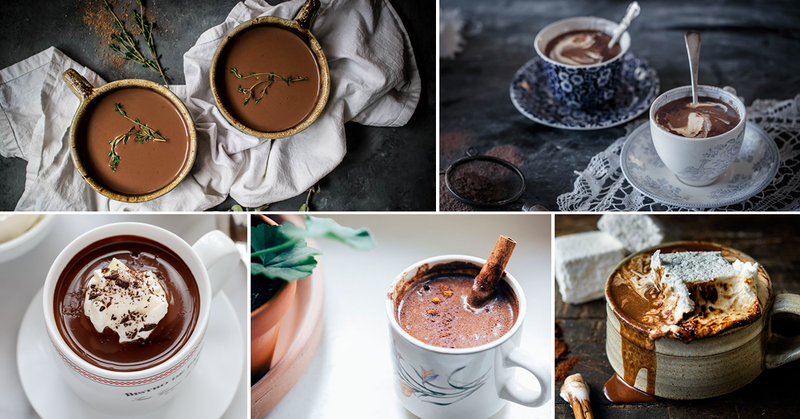 I’m sharing some recipes that are absolutely delicious and perfect for the holidays. Baking (and cooking in general) is such a passion of mine and I especially love to do it during the holidays. I love seeing people smile whenever I make them a meal or bake a dessert for them. 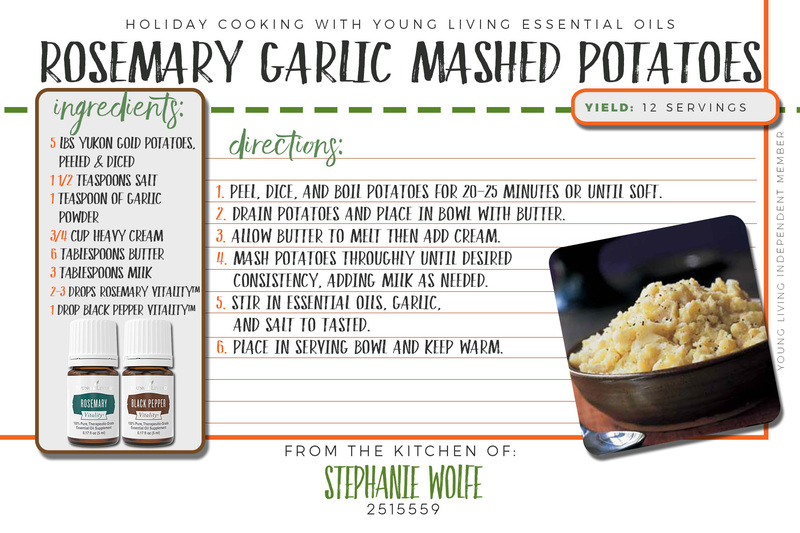 Food brings people together, and I love that I can add my essential oils to them as well. There is just something so satisfying about cooking for my friends and family and having them enjoy what I’ve made them. It’s something that my Memaw did for me every day after school with her homemade tortillas and it’s something my Aunt Gloria always did as well whenever we would bake Christmas cookies together. I see that love in my mother-in-law as well, and I hope to pass down my love of cooking to our children when they are big enough. 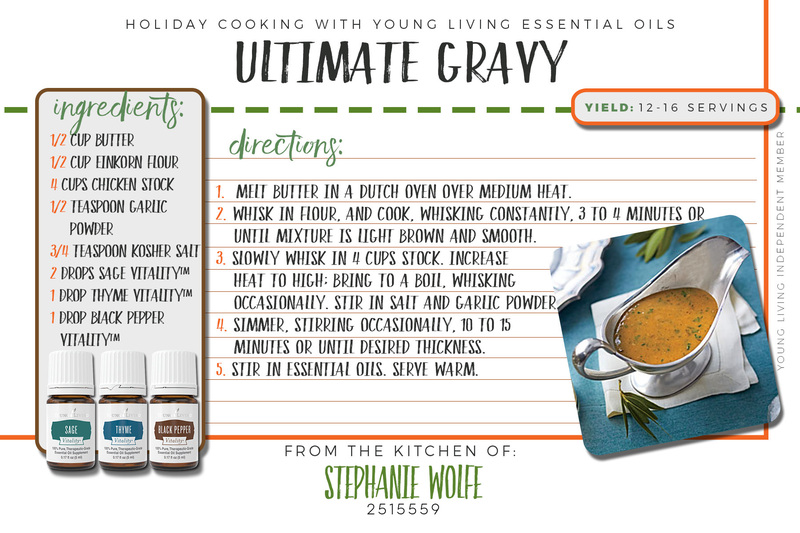 I’ve divided the Holiday Cooking with Young Living Essential Oils recipes into main courses, side dishes, and desserts for you to navigate a little easier. Don’t have essential oils? You can get some info about Young Living Essential Oils on my blog, and I even can tell you how to order some! Although our family makes turkey on Thanksgiving, I’ve been known to make a ham for Friendsgiving and Christmas. I really can’t decide whether I like ham or turkey best- just depends on my mood! You can’t go wrong with either of these amazing recipes though! My favorite part of Thanksgiving and Christmas meals definitely has to be the wide assortment of side dishes that come along the main course. It’s Addie’s favorite too! 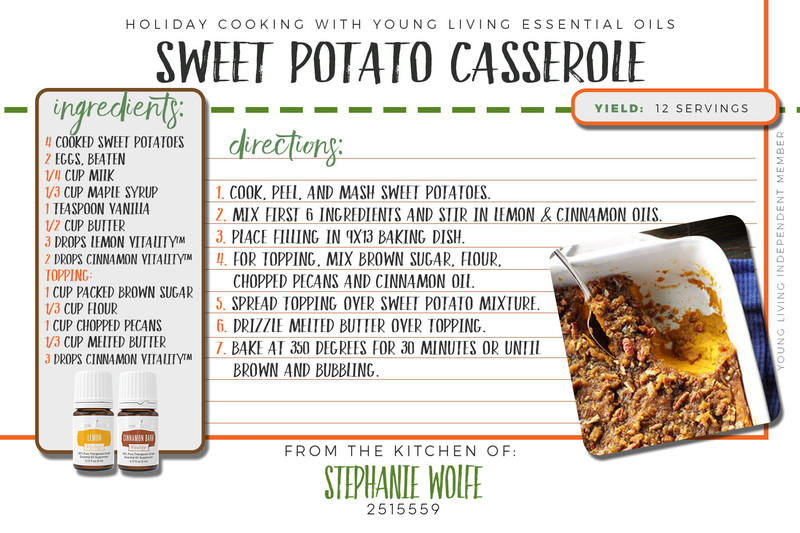 While Addie loves sweet potatoes and mashed potatoes most (we make our sweet potatoes with Orange Vitality essential oil), I’m partial to the green beans. Give me green beans in a casserole, with bacon, or with butter and lemon- I don’t care how I get them, as long as they’re in my belly! 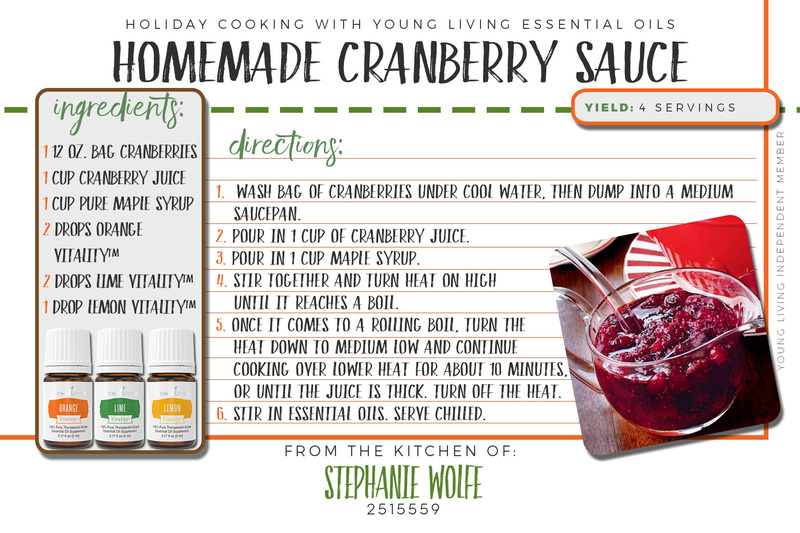 I’m also obsessed with homemade cranberry sauce. 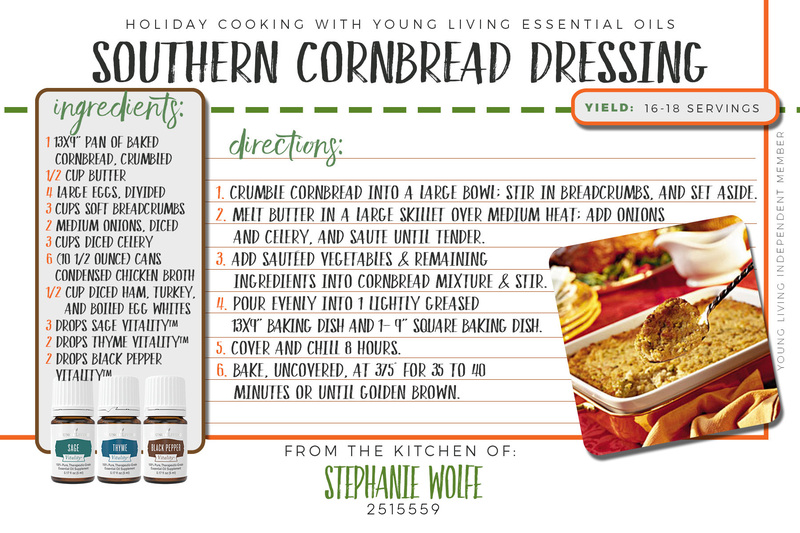 I actually use this specific recipe every Thanksgiving and Christmas and everyone absolutely loves it. 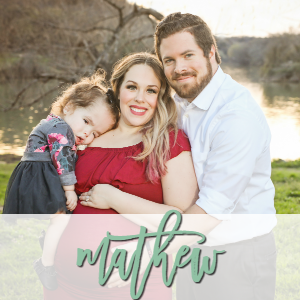 Mathew is a bit of a dressing/stuffing lover and the more sage in there, the better! For probably 10 years now I’ve been making the pumpkin pies for Thanksgiving and Christmas. Pumpkin pie is my absolute favorite holiday dessert and I love it with fresh whipped cream. Yum! I have never made a big pumpkin pie with Vitality oils BUT I have made pumpkin pie filling and put it into little phyllo cups for mini pumpkin pies. Let me tell you- they were insanely delicious! 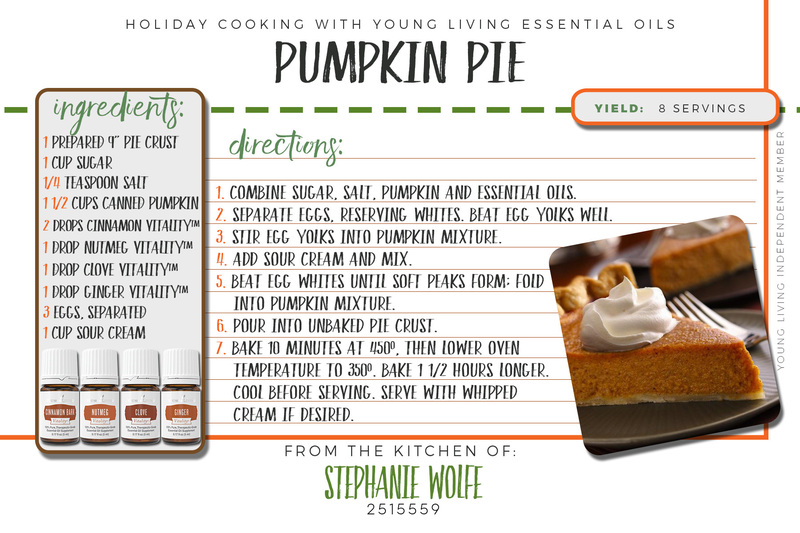 These essential oils pack a punch and make the pie so tasty! 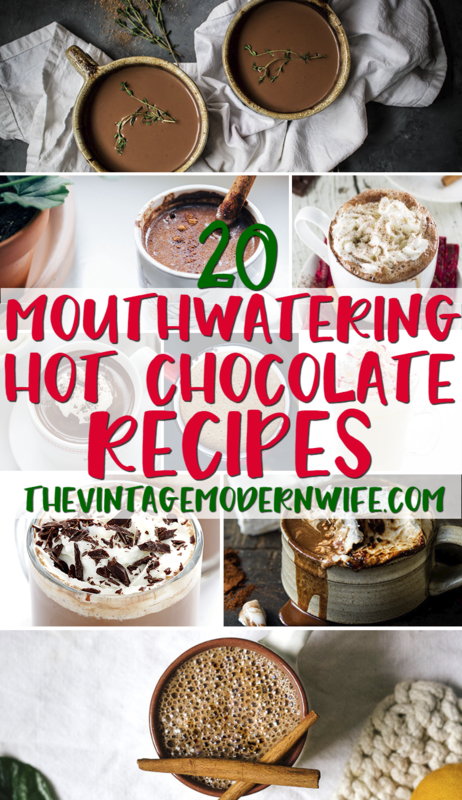 I hope you are able to try these recipes for Thanksgiving or Christmas this year! 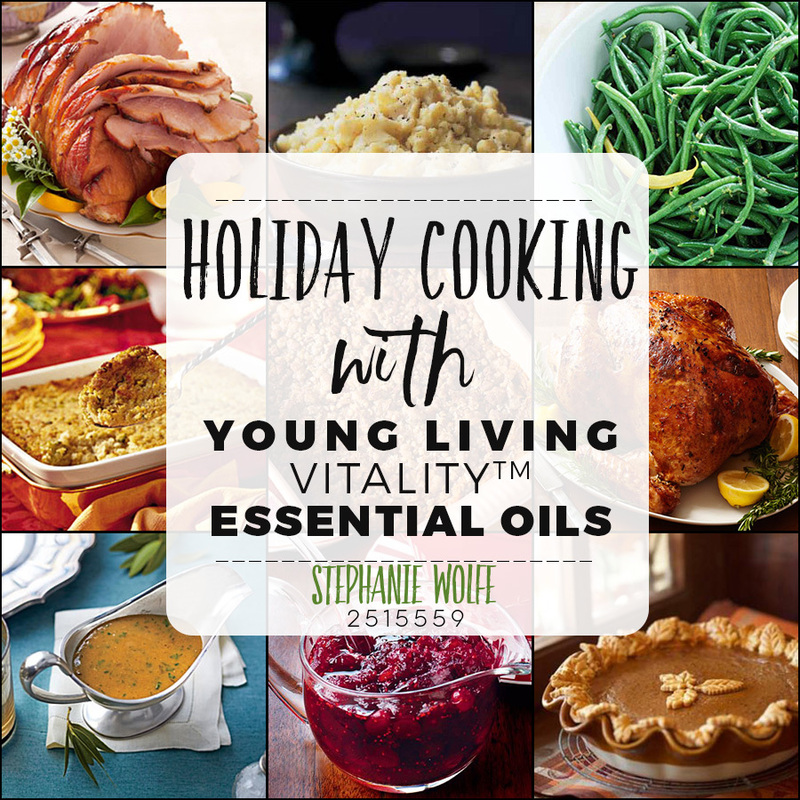 Cooking with Young Living Vitality oils is always so fun for me and I can’t wait to hear how much you’ve enjoyed it too! 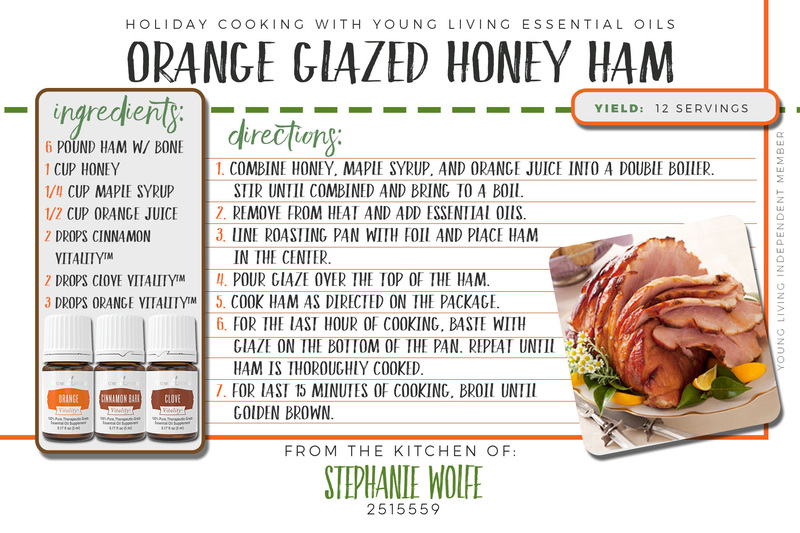 Tell me- what’s your favorite recipe that you eat at your Thanksgiving or Christmas meal? 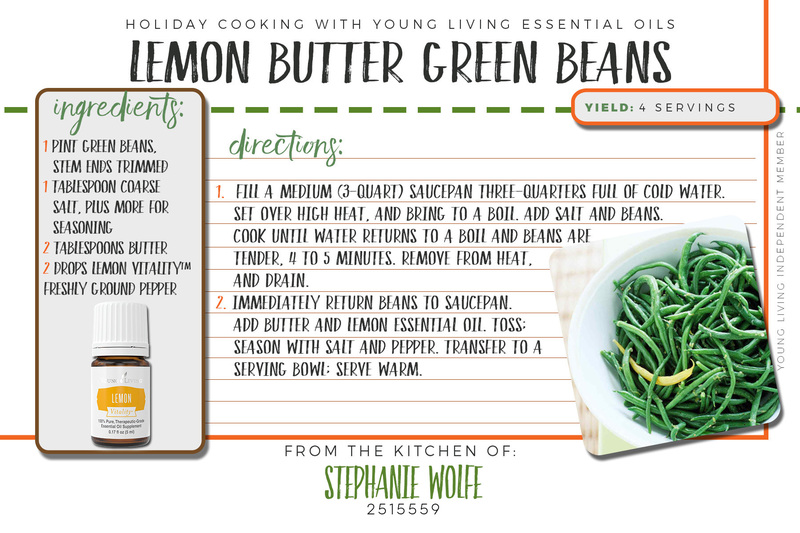 Which recipe here are you most excited to get cooking with Young Living essential oils?